As some of you know, for years I have been researching on the history of Roberto Estalella, who at age 24 in 1935 made his debut with the Washington Senators. While everyone knows (and the world owes a huge debt to) that Jackie Robinson was the first African American to play in the Major Leagues, what many people do not know, is that he was not the first man of African descent to play in the modern Major Leagues - Estalella was. While white Cuban players had been playing in the Major Leagues for decades prior to Estalella's debut with the Senators, "Tarzan", as the American press nicknamed him, was the first Cuban player who managed to "pass" the color test by being identified as a "Cuban" rather than as a black man. This is but one of many examples of the embarrassing and erroneous American tendency to use race, ethnicity and national origin interchangeably. Cuban newspapers of the period had a good time discussing the fact that while everyone in Cuba "knew" about Estalella's racial background, he was such a good player that Clark Griffith's Senators were quite happy to look the other way, cough, cough and pretend that the handsome half black, half white third baseman was "white"; after all, the many Cuban players who preceded him had blended in perfectly fine into the all white Major Leagues. A Cincinatti newspaper even described a couple of them who played for the Reds in 1910 as "two of the purest bars of Castille soap that ever floated to these shores." But back to Estalella, I've just come across the below picture, which is possibly the earliest known photo of Estalella in Washington. We see Estalella in uniform shaking the hand of the Cuban consul in Washington. 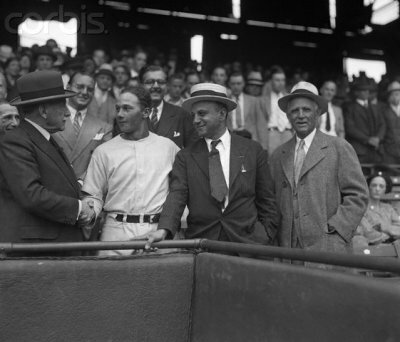 To his left is Joe Cambria, the Italian-born agent who signed Estalella (and over 400 other Cuban baseball players) to play professional baseball in the US; to Cambria's left is Clark Griffith, owner of the Senators. Who knows what private suffering and insults in baseball's harsh racial climate of the 30s, 40s and 50s this powerful man endured in his many years in professional baseball, and like Robinson, was forced to bite his lip and look the other way? That's also Estalella to the right. We tip our hat to this unsung hero. Later I will tell you about Manuel "Chino" Hidalgo, quite possibly the first baseball player of Asian ancestry to play professional baseball in the US.